On 8 January 2019 the Danish Transport Ministry (DtM) banned the circulation of pocket wagons on the Danish railway network. This was in response to the tragic accident on 2 January, where parts of a semi-trailer train came off and hit a bypassing passenger train, resulting in eight fatalities. The ban was temporary and according to reports applicable for a two-week period. Moreover, the ban could be lifted if the single railway undertaking submitted documentation that proves the correct fixing of the kingpin of the semi-trailers into the supporting bock of the pocket wagon. 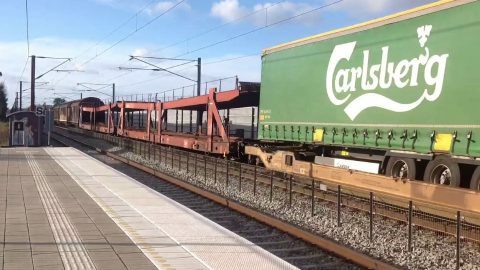 This was accomplished by Hector Rail, CFL Cargo, TX Logistik, Hupac and also DB Cargo, the operator which was involved in the accident. 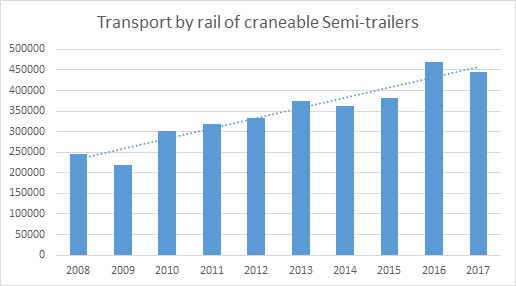 Over the 10 years 2008 – 2017 more than 3 million craneable semi-trailers were carried in pocketwagons across Europe as the railway part of their multi-modal journey. In an average year based upon this period this equated to just under 346 thousand per year and just under 950 per day. In Denmark in an average year (2010 – 2018 estimated) the number of units transported per year was 51445 equating to 140 per day (between 5 and 12 trains per day) and this approximates to just over 14% of the European total. The graph below shows the increases that have taken place in the transport of semi-trailer vehicles across Europe (EU28 + NO + CH). With the last remark, it hints towards the relatively less safe road transport. “According to our records, there have only been two accidents with pocketwagons during the last 13 years. Statistics show that transporting goods by rail is 19 times safer than transporting those same goods by road. When broken down by individual country the transport mode is safer than road in a range from twice as safe, up to 70 times safer”, ERA states. This being said, the regulatory body of the EU, as well as national regulatory agencies have not left the accident undiscussed. Steps have been taken on all levels to analyse what went wrong, and whether this means that the statistics of the last several years are a merely good fortune. The exact cause of the accident is still being investigated. This is done by the Danish The Danish national investigation body (NIB). Meanwhile, other member states have taken similar steps to see whether the transport mode used for years is indeed safe. This is true for the Dutch Human Environment and Transport Inspectorate (ILT), which in turn cooperates with the German, Belgian and Danish authorities on the matter. 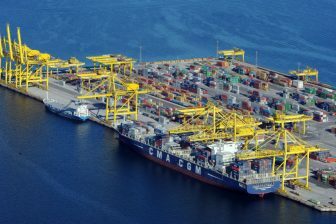 Earlier this month, the German inspection carried out a pocketwagon check, the ILT said. “They keep us informed about the results, and we will discuss them further with ERA in order to see what role they can take. 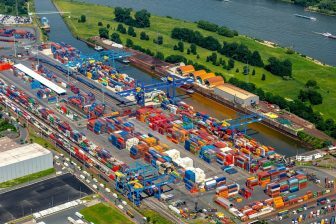 These inspections are important, because freight transport goes all over Europe and that must be done safely”, the Dutch authority noted. 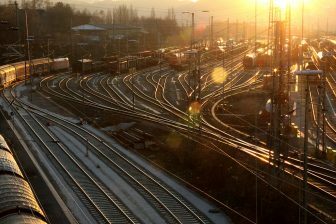 “Investigations need to be done to understand the reasons why the semitrailer was torn from the wagon; in case additional safety measures are needed, they should be introduced Europe-wide in a harmonised and coordinated way”, commented the European Rail Freight Association (ERFA). Whether a European wide safety measure is possible, the ERA cannot say. “The main role of the ERA in preventing accidents is to facilitate the exchange of information between Member States. The investigation of incidents and accidents in EU railways is a national task. It is primarily the responsibility of those discovering an issue to disseminate it to others.